SDDC - Software-Defined Datacenter. Source. 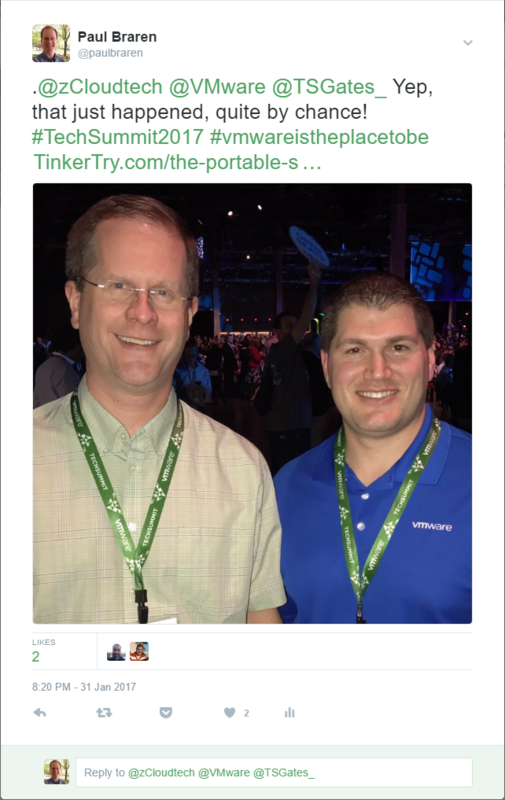 Zack Widing, Federal Sr. Systems Engineer at VMware. When the picture above first emerged on Twitter back on December 6th, my reaction was a mix of wonder and joy, with a touch of jelly. This Zack Widing @zCloudtech has taken the Xeon D platform and run with it. Like literally, he can probably run through airports with it. He's a busy Federal Sr. Systems Engineer at VMware. Having done Secret Clearance/Federal work myself a few years ago, I know how important it is to prepare something self-contained that assumes no connectivity of any kind, to any thing upon arrival. So the weeks went by and no details arrived, Zack's one picture taunted us and sparked our imagination, this impressive and mysterious assembly of power. Until today, that is, as the curtain gets peeled back for all of us. Zack's traveling demonstration solution is incredibly well through out, and at a price point well beyond anything TinkerTry can tackle. You see, this VMware employee has made himself a 4 node cluster that's dedicated to doing amazing customer-facing demos of SDDC, versus my home lab that is very much a dual node cluster, where one node goes on the road (or plane's overhead) with me doing live demos at various user groups, while the other node stays home with real data on it, and sometimes even doubles as my Windows 10 workstation too. I say, good on him! This sort of tinkering does all of us a lot of good, setting new aspirational highs for the rest of us. Really showing off what can be done on-the-go, using powerful and efficient 10GbE Xeon D in the form of the compact 1U Supermicro SYS-E300-8D SuperServers that now start right around $639, about the same as the less expandable Skull Canyon mobile Core i7 NUC. Coupled with 10GbE and NVMe storage, and you have quite the horsepower to go the distance with even the most bloated SDDC. Xeon D SoC (System on a Chip) aren't mobile processors, this systems server-class Xeon D-1518 is 4 cores that sip 35 watts and weigh in at ~$1000 with 64GB of RAM, or ~$1500 with 128GB. Doing some quick math, things still get interesting real fast with 4 of these little guys. I can fully appreciate the pains he went through to find vSAN compatible SSDs, which tends to be way too enterprisey/pricey for most mortals. I felt such pains myself first-hand. I'm certainly looking forward Zack's upcoming articles, especially since he hasn't yet detailed how he got "creative" when devising ways to cram all that storage in. So without further words, it's time for you to head on over to read his glorious work-in-progress. 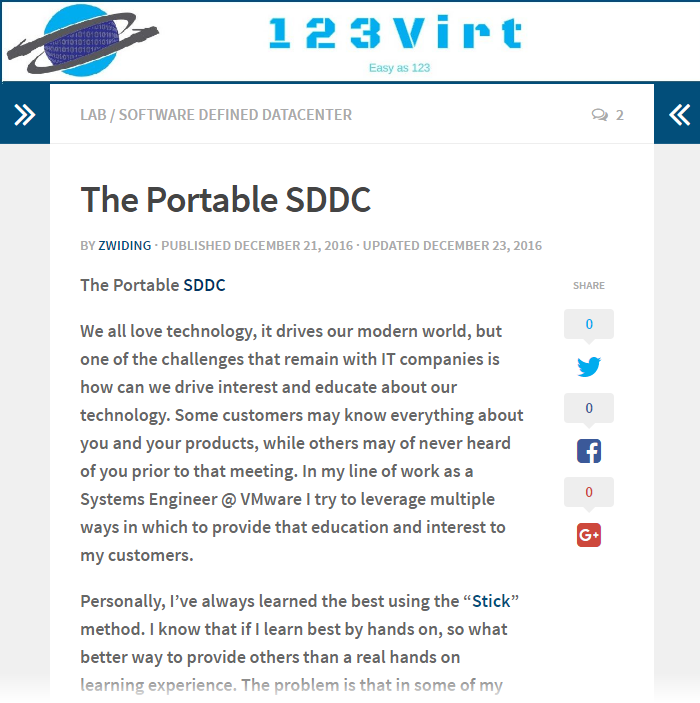 It's a pretty amazing start to his new 123Virt blog, where he graciously gives a shout to many home virtualization lab enthusiast sites. Check it out! I know I certainly learn better by doing, and teaching by demonstrating is a way to try to share that joy. My own home lab needs require a bit more quiet than the current 1U SYS-E300-8D and SYS-E200-8D high RPM fans allow, which is one of the reasons I've held off on creating a TinkerTry'd bundle from them. I'm also more a fan of RJ45 over SFP+ for my 10GbE, giving me the versatility to use those 2 Intel X552/X557 10GbE ports for 1GbE needs as well. And finally, the fan on the managed Ubiquiti ES-16-XG 10GB switch was louder than any Xeon D SuperServer at idle, and louder than the Netgear XS708T that I wound up keeping. For travel or 2 node clusters like mine, I'm still a fan of the fanless unmanaged ASUS XG-U2008 with slender SlimRun Cat6a cabling. But that's just me and my needs and opinions, with a home lab slant. I'm always thinking ahead about even tinier and quieter solutions where multiple nodes might be fitted into custom chassis. Been thinking about that since way back in May of 2015 actually, with this tweet in those ancient times before the Xeon D had first shipped. Meanwhile, it was great to help get the Xeon D-1541 onto the VMware HCL, but I keep politely asking Supermicro for updates on how they're doing with getting all their Xeon D on the VMware HCL, right up through vSphere 6.5. Supermicro's Nihir Parikh intends to get all Xeon D SuperServers onto the VMware Compatibility Guide. The SYS-5028D-TN4T with the X10SDV-TLN4F motherboard features Xeon D-1541, and has been on the VMware HCL for ESXi 6.0 since Feb 2016, sharing BIOS and IPMI with all other models, differing only in core count. Meeting for the first time at the VMware Worldwide Kickoff event in Vegas recently, you can image Zack and I had a lot to talk about. It was fantastic.